Why? Well, when using English, the plural form is indispensable. Grasping the full importance of the plural form can be pretty difficult for a lot of native Japanese speakers, because the Japanese language doesn’t really have one. However, English-speaking babies are able to use the plural form in simple phrases like “one boy, two boys; one man, two men; one girl, two girls; one woman, two women….” If you counted all the nouns used in everyday English conversation and writing, I think you would probably end up with more plural nouns than singular ones. When one sees the singular phrase “foreign tourist,” one imagines a single traveller who has just arrived from another country. So if you’re trying to attract more than just one person to your business, you should use the plural form “foreign tourists” instead. Since most stores, restaurants and businesses offer or provide large quantities of the same items, the sentences in English signs in countries proficient in English generally contain plural words and phrases. For example, one uses the phrase “short stays” for 短期滞在 (tanki taizai) and “long stays” for 長期滞在 (chouki taizai). Creating an English window sign and getting it up requires a lot of time and energy, so wouldn’t it normally make sense to check and see if the English phrases and sentences you’re using are actually okay? 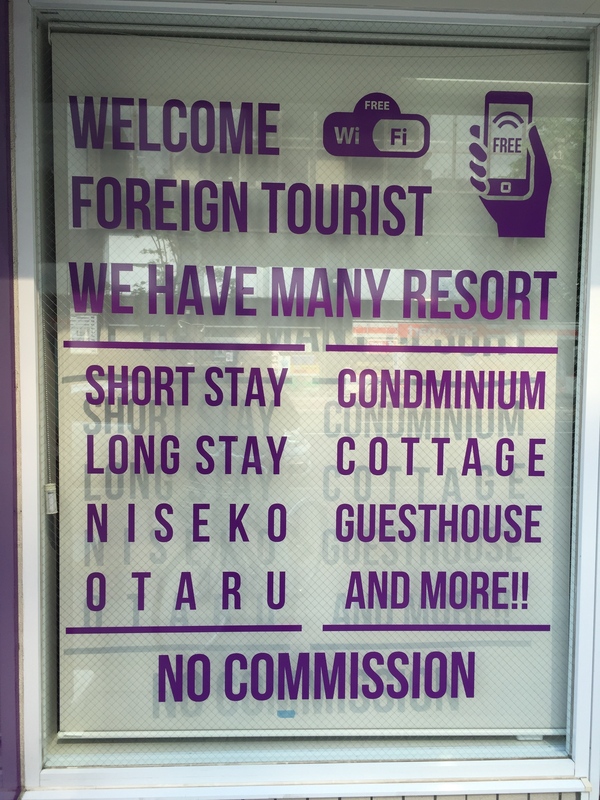 I appreciate the fact that more people are making English signs in order to reach out to foreigners, but some of these attempts seem rather flaky. If you’re making a sign in English, please check your spelling and show the sign to a native English speaker to see if it looks good before putting it up. At Mike’s English Class Sapporo, in addition to providing proofreading and editing services, I give one-to-one lessons in English conversation, business English, English for travel, academic writing, and preparation for English tests including the TOEIC exam.